After a rocky start (read: murdered landlord) to our arrival in Cobbler Cove, OR, things have finally slowed down. My demon buddy Coop and I, along with our sassy talking owl Livingston, have settled nicely into our newly opened shop, Inkerbelle’s Tattoos. We’ve met some awesome people, including new friends Higgs and Knuckles, and we’re forging friendships with our fellow business owners. And sure, we’ve had a few glitches (see Jeff), but we’ve found our groove, our clientele is growing, and everything’s pretty great. That is, until Portland’s World Naked Bike Ride finds us smack dab in the middle of another murder mystery! Yep, you read that right. Naked people. On bikes. It ain’t pretty. And even less so when a dead, bare biker lands right on our doorstep. Okay. Not true. I’ve binge-watched a lot of police shows on Netflix. But I’m armchair ready, if nothing else. So ready! Now, if only the evil spirit possessing me would let me investigate in peace—and I don’t end up dead in the process. Join me, Coop, Livingston, and Higgs for another Nun of Your Business Mystery! A new cozy mystery from USA Today bestselling cozy mystery author Dakota Cassidy, Hit and Run, Book 2 in the Nun of Your Business Mysteries series! Join Trixie and Coop as they settle into their new home, make new friends, and stumble into another murder investigation. 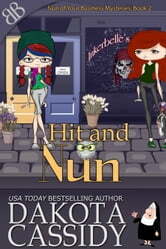 Hit and Nun by Dakota Cassidy Talking animals from hell. That’s the beginning of this 2nd book in the Nun of Your Business Mystery series. Per the author, and I agree, these books should be read in order. Full of funny cliches, one liners and old trivia worthy phrases, this paranormal cozy mystery is a hoot. The bumbling amateur sleuth gets in the middle of another death investigation in the name of protecting her friends. Relationships are deepening between the main characters as the storyline and arc progresses. Lots of questions on my head about upcoming dangling clues: will more develop between Trixie and Cross? Will Coop’s fixation on Alexis Carrington go further? Will the owl and the dog become friends and will a new talking animal join the crew in the next book? Crazy questions for a crazy cozy mystery series. The second entry to the series picks up not long after the first finishes with our favourite ex nun and demon finally making a living. Sounds boring until Ms Cassidy works her magic by throwing in a dead naked bike rider..... Hilarious moments, excellent turns of phrase and poor Jackie Collins imitation makes for a well written book with the main mystery solved and the underlying one getting more intriguing.